Moto Accossato began in 1969 and immediately began producing motorbikes. Sport competition victories have always marked its history. Like the Enduro 1985 world champion, Pier Franco Murglia, the 1983 and 1984 European champion, Pier Franco Murglia and the 1985 European champion, Stefano Passeri. Accossato is a synonym for a very successful sports motorcycles built in Italy and as a small series. The quality and ingenuity of these motorcycles was ahead of its time. Central spring leg and water cooling system were standard. All motorcycles had the color red. Founded the company Accossato the former Motocross rider Giovanni Accossato. His passion for the processing of the material aluminium is very concise. Accossato Giovanni 1969 had the courage to own a motorcycle to develop and made garages in a farmhouse built in small series. He often closed himself in the workshop overnight, pulled, machining, drilled the whole night and woke up the next morning next to the motorcycle. He wanted a motorcycle, that was fast, accurate and easy to maneuver. The company Moncalieri was near Turin in Italy. 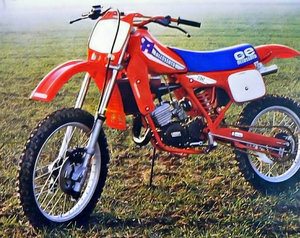 Produced motorcycles of 50cc to 125cc for the dirt bike sport. Until 1981 different drivers disputed national races. In 1982, for the first time he ventured with a small team on the international stage and won the entire European Championship in the 80cc class Enduro with the rider Pierefranco Muraglia . In Italy, those same Muraglia bikes won the Italian champions the same year. Just one year later on an 80 Muraglia iger Accossato won the European champion. And the next two years, the titles in this class went to Accossato. Again, in 1984 and 1985, P.F. Muraglia Stefano Passeri were the pilots. Only when the 1988 engine supplier Minarelli was sold, did G. Accossato cease the production of motorcycles.